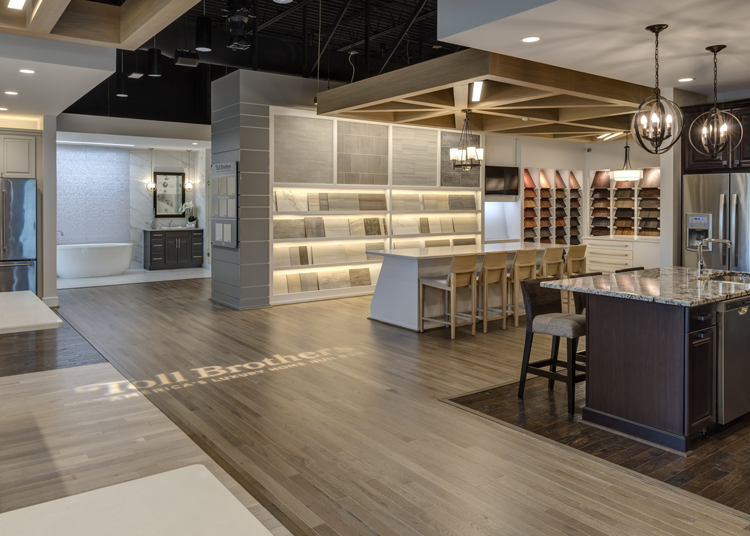 Toll Brothers, a residential building outfit in metro Detroit, is using a 5,000- square-foot design studio to show off all of the different options they can build with. Toll Brothers uses a a 5,000- square-foot design studio to show off all of the different options they can build with. There’s no shaking the fact that residential builders outfit their model homes with a design room so buyers can select everything from door handles to kitchen cabinets. The trouble is, the design rooms are often set in a small bedroom and lack perspective. For Toll Brothers, which is building nine residential developments in metro Detroit and has three more projects opening in Ann Arbor and Scio Township this year, the solution was to open a 5,000-square-foot design studio in Plymouth Township where customers can walk through fully furnished kitchens, bathrooms, bedrooms, and great rooms. “We’ve been doing well in metro Detroit, as we sold 154 homes last year and this year we’re looking to sell 300 homes,” says David Straub, president of the Michigan Division at Toll Brothers, which is building in Ann Arbor, Northville Township, Novi, and Canton Township. In addition to developing single-family homes, Toll Brothers is exploring the construction of mid-rise residential buildings in urban areas in Michigan, including luxury condominiums and apartments. Potential sites include downtown districts in Detroit, Grand Rapids, or near the University of Michigan (the company builds mid-rise apartments for students).